When I first volunteered with the troop committee, there was a lot of interaction between the Scouts and adults on campouts. At one low point in our membership (a trend that was not surprising in retrospect), we had nearly as many adults as Scouts going camping. Why not? – the adults enjoyed camping as much as the boys did. However, the adults didn’t exactly leave the boys alone. In fact, on many campouts the boys asked the adults to do the cooking (and the adults agreed – especially the Scoutmaster). I’ll say we had some delicious meals, but that’s not the point, at least for the Scouts. We’d get to camp and the adults would be barking orders at the Scouts to get the dining flies and tents set up over there, and would jump in and do it for them if they were having trouble. Hikes were nearly always led by the Scoutmaster or an assistant (as in the movie Follow Me Boys or any of a dozen other stereotypes). Adults often fiddled with the menus the boys drew up (even making the menu occasionally themselves), taught Scout skills, built fires, and got on the boys to clean up. It’s no wonder I was conflicted about the way I saw things unfolding versus the way I had heard it was supposed to be. I didn’t know it at the time, but it was a classic sign of untrained adult leadership. It took many years and a succession of Trained Scoutmasters to bring things back on track, and today the troop is back to being youth-led. Except for the impression that we need lots of adults hanging around. Overall, it’s not a bad idea to have sufficient adult presence at outings. I advocate something called the safety rule of four – a minimum of four adults is recommended on a campout, so if it’s necessary to remove a youth (to take him for medical attention, say), there would be two adults remaining in camp. When not actively needed, though, these adults need to know to stay out of the way, to tend to their own business and to not get in the middle of what the Scouts are trying to accomplish on their own. This is where the Scoutmaster comes in. The Scoutmaster trains and mentors youth but leads adults. But how does “training” differ from “leading”? Simply put, the Scoutmaster is in charge of the adult “patrol” much the same as the senior patrol leader is in charge of the Scout patrols. A Trained Scoutmaster is knowledgeable in the role the adult plays in a youth-led troop, and is the authority figure (as designated by the chartered organization) in conveying that role to the others. Adults who wish to camp with the troop must agree to follow the Scoutmaster’s direction at all times and not intervene in youth activities unless asked to do so by the Scoutmaster (situations of immediate hazard notwithstanding). As mentioned in the last article, there’s not a lot in the official training on what to do about unregistered untrained adults. Really, there’s not much for them to do. Other than driving Scouts to and from camp, adults should camp separately from the Scouts, staying away from them except to observe their activities from a distance (literally – 300 feet is a good minimum) and intervening only when it’s a matter of safety. These “other” adults can camp as their own patrol, cook their own meals, go on a hike by themselves, and just enjoy the outdoors. A better question might be: What don’t they do? Well, for one, they don’t ever do what a Scout can, or is supposed to, do. Unless it’s for the adult campsite, they don’t build fires, manage the equipment or lead activities. They also don’t get in the middle of what the Scouts are doing. They don’t supervise or direct a patrol’s campsite setup, fire building, skills instruction or meal preparation. And most importantly, they aren’t Mom or Dad for the duration of the campout. Many a parent wants to hang around with their son, do the things he’s doing with him, hike alongside him or sit down for a meal. Those things are fine, and it’s great to do them with your son – just not at at Scout campout. Plan a father-son weekend alone or with others if you want to do that, but understand that Scout camping is about the patrol method and Scouts relating to each other, not to their parents or other adults. Despite these don’ts, is there an upside? Sure! Parents who aren’t registered or trained can gain a better understanding of what their son is experiencing by observing Scouting in action from a distance. They can watch what patrols do, how their mini-society operates, and how the boys interact. They can see their own son grow and develop, learning how to take responsibility for his role as it relates to others, and gaining new skills in the process. Through proper application of the patrol method and appropriate distancing of the adults, they can understand why Scouting operates the way it does and can better support the adult leaders. And who knows – maybe once they’ve seen what Boy Scouting is really all about, they’ll want to volunteer, and get Trained, themselves. There are plenty of jobs helping or serving on the troop committee – something for everyone. 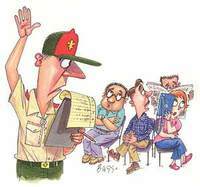 Those who have a special knack for working with youth may find being an assistant Scoutmaster is a good fit. So don’t rule out adult participation at meetings and campouts – but be very careful that “other” adults know, understand and don’t disrupt the methods we work so hard to implement. “to train youth leaders and to lead adults.” Clarke Green is exactly correct. I know that Ask Andy prefers to have very few adults on campouts and only registered and trained SMs and ASMs. I understand the reason and somewhat agree with it, HOWEVER. In almost all cases, when I was SM, the troop’s most productive and active volunteer leaders were recruited on campouts, summer camps and not in meetings. I always had a large contingent of YP trained committee members on most campouts. It was sometimes a bit of a chore to train them, but campouts are the best place to do it. Campouts and summer camps are where men catch fire for Scouting. The more adults on campouts I had the more active and productive committee members and ASMs I had. I do agree, however, that it requires the SM to take charge, establish very clear rules, and sit on those who don’t get it. I, for one, don’t have a problem doing that. Some people find it harder. I also had very few problems with folks worrying about “what is happening out there”. If they wanted to know, they could come on out for a weekend or stop by and visit. This was especially true during the three years I was SM and my sons weren’t in the troop. They had already graduated and moved on. Anyone who wanted to know what was happening, I was happy to have them come and find out. Once you have an experienced cadre of adults who know and understand how a campout works they will “peer pressure” the new folks into coming around to the scouting way. It does mean that the leadership must be very intentional about enforcing separation. Great thoughts, Larry! I see your point about the best volunteers coming from among those who show up for campouts. Some of my best committee members were those who just showed up at a campout or a committee meeting. It’s a sign that they’re interested and are willing to do something if asked (it’s up to you to figure out what that something is). I’ve also seen the parents we’ve led down the Scouting trail spread the enthusiasm to others. It’s gratifying to see something that you’ve started the ball rolling on keep on rolling.